Gadjah Mada University (UGM) provides orientations to the new students so that they can adjust to the new university lives immediately and, thus, succeed in their studies. This orientation program is called Pelatihan dan Pembelajaran Sukses Bagi Mahasiswa Baru (PPSMB-Successful Training and Study for New Students). 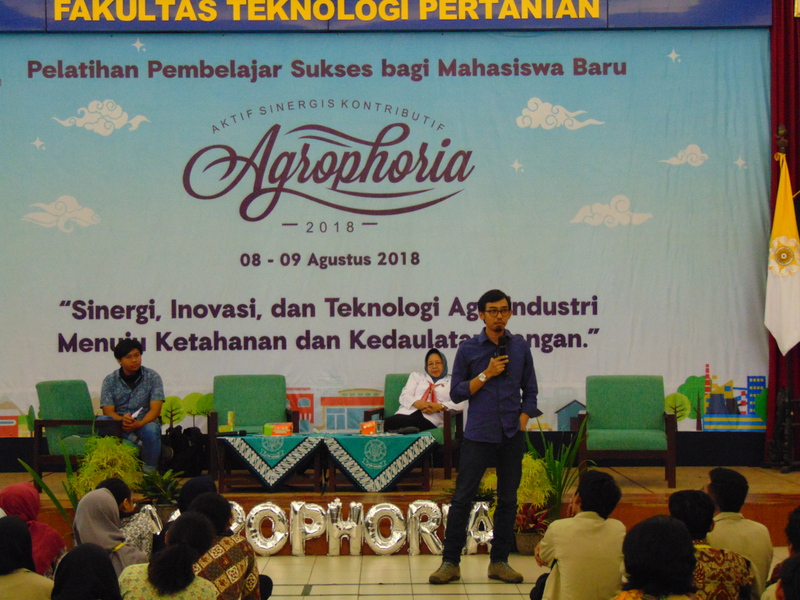 The Faculty of Agricultural Technology (FTP) holds the 2018 orientation with the theme of “Synergy, Innovation, and Technology in Agroindustry for Food Security and Independence”, and invites Yogyakarta Food Security Bureau and PT. Indmira to provide materials. The event takes place at the faculty on 8 August 2018 attended by approximately 335 new students of FTP-UGM. Indmira is represented by the CEO, Mr. Aryo Wirawan, who explains that food security and independence is the responsibility of every citizen, and calls the students to employ the latest technologies to realize it. He further says: “We should always be open to and adopt various available knowledge, especially information technology. Therefore we can produce technology that is needed for advancing and developing agriculture.” By using the information technology optimally to obtain the appropriate data, PT. Indmira has been developing farming methods to be actively involved and supportive of the agricultural industry. We have been able to show the possibility of farming on marginal lands, such as the coastal sand and reclaimed mines, to replace the dwindling fertile lands that have been used for residential and other industrial purposes. By doing research and developing the appropriate methods, we can safely and profitably produce staple and horticultural crops on marginal lands. A question-and-answer session follows the presentation. Attendees actively and enthusiastically respond to Mr. Wirawan’s lecture by asking questions on the succesfull and on-going research projects that take place in PT. Indmira. In his closing statements, Mr. Wirawan advises the students to “decide what to do in life now. Don’t be afraid to dream and be brave to make mistakes early because there is always time to improve!” He encourages those with ideas and aspiration, to “do it”.